This encyclopedia consists of fourteen sections and seventy chapters. It caters to the subject of Mahdaviyyat and its different perspectives, based on the verses of Quran and authentic traditions. This encyclopedia on Madaviyyat, which is a product of research center belonging to the Institute of Dar al-Hadith, a scholastic cultural institute, has been presented to the supreme leader of Revolution on the auspicious occasion of 15th Shabaan. For the sake of familiarity with this work, let's have a quick look at different sections and chapters of this encyclopedia. Due to importance of the topic of Mahdaviyyat and its special beliefs, before going into the details of life of Imam Mahdi (a.s) from birth till formation of a global government, this section takes a general look at it from the perspective of Quran, Prophet (sws) and Ahl-e-Bait (a.s). This section mentions the verses and traditions which depict the necessity of presence of Imam and proof of God on earth at all times, from the beginning of human society till the end of world. Also these traditions prove that, after the demise of Prophet (sws), the Imams will be from his (sws) progeny. At the end of this chapter, these traditions are analyzed and some doubts answered. In this chapter, a very important issue of continuation of Imamat in the progeny of the last Prophet (sws) is proved, based on the mutawatir tradition of Thaqalain related by both, Shias and Sunnis. At the end of this chapter, there is a summarized analysis of the authenticity of this tradition, its indication towards infallibility of Ahl-e-Bait (a.s), their authority in knowledge as well as Imamat of Imam Mahdi (a.s) and his (a.s) absence. In addition, it also describes few significant points regarding this tradition as well. This chapter, first describes a number of traditions from the Prophet (sws), in various expressions, which identify the leaders after him (sws) and in continuation of the chapter, research is done into the references of these tradition, their origin in time and place, differences in their content, their purpose and different opinions that exist in this regard, proving that the opinion accepted by the followers of Ahl-e-Bait is only the right one. This chapter proves, based on the authentic traditions that, it is obligatory for every Muslim to have a recognition of Imam of his time, who is from the progeny of Prophet (sws). Then it mentions the excellence of knowing the Imam and dangers of not knowing it. It also brings the traditions from Ahl-e-Bait, which prohibit us from denying of Imams, specifically the twelfth Imam (a.s). In the end, it explains the responsibility of those who are not capable of knowing the Imam (a.s). The subject of this chapter, is the glad tidings in different verses of Quran, regarding the expanse of Islam, formation of Government by the righteous, and leadership of powerless in the future. In the end it investigates into the verses which point towards the global government of Imam Mahdi (a.s). In this section, the life of Imam Mahdi (a.s), from his genealogy till his long life based on traditions from Prophet (sws) and Ahl-e-Bait (a.s) has been explained into seven chapters, as mentioned below. This chapter mentions some clear traditions depicting Imam Mahdi (a.s)’s direct relation with the family of Prophet (sws). It also mentions the traditions, which state in detail about his forefathers. 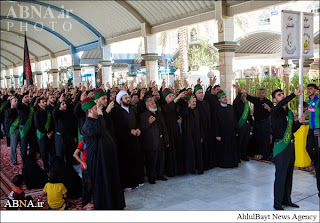 By taking into account that, most of Sunnis believe that genealogy of Imam, reaches to the Prophet (sws), through Imam Hasan-e-Mujtaba (a.s), with the help of research done, we will prove that, Imam Mahdi (a.s) is the progeny of Imam Hussain (a.s). This chapter ends with the probe into Imam (a.s)’s mother. This chapter mentions the date of birth of Imam Mahdi (a.s), its circumstances and affairs related to this subject. This chapter probes into three different issues viz. time and place of birth, his (a.s) unusual growth and regarding his (a.s) speech after birth. This chapter reports, Imam Mahdi (a.s)’s different names and agnomens. Looking at the belief of some Sunnis who say that, the father’s name of Imam Mahdi (a.s) was homonymous to Prophet (sws)’s name, which contradicts the belief of followers of Ahl-e-Bait, we, in the light of a probe, will disprove it. Then we will come across an analysis of a tradition which stops us, from taking Imam Mahdi (a.s)’s name. In the third analysis, the instruction to stand up in respect when the name “Muhammad” or agnomen “Qa’em” is taken, will be discussed and in the end the agnomen “Aba Saleh” will be discussed. This chapter talks about, fourteen different characteristics related to the body and appearance of Imam Mahdi (a.s), extracted from the traditions in this regard. This chapter initially mentions a tradition about the long life in three different categories and then discusses the proof of actual possibility of long life and existential proof of long life. In this chapter some of the prominent characteristics of Imam Mahdi (a.s) have been collected based on the traditions. Some of them are for example, resemblance with some of the prophets, the Zulqarnain and much of the resemblance with the last Prophet (sws), his (a.s) excellency over other Imams except Imam Ali (a.s), his (a.s) presence in Hajj every year and his (a.s) leadership over inhabitants of heaven. It ends with the explanation regarding the leaders of heaven. In regards to Imam Mahdi (a.s), especially in current times, questions have been raised, knowing the answers of which is necessary, especially for the young generation. In the context of different discussions in this encyclopedia, related questions have been answered. Hence in this chapter, only those issues are handled, which are not discussed anywhere else in the encyclopedia; like Imamat in the childhood, Imam Mahdi (a.s)’s marriage, places related to his (a.s) and Khizra Island etc. In this section, the issues related to the disappearance of Imam Mahdi (a.s), have been discussed and analyzed across three chapters as mentioned below. Prophecies by Prophet (sws) and Ahl-e-Bait (a.s), about his absence is one of the key steps towards, making the grounds for his absence. So in the beginning of this chapter, a complete analysis have been done regarding the most important steps taken by Ahl-e-Bait for preparing this ground. Then these prophecies are mentioned; like the incidents which divide this absence into two parts, one is small absence (Ghaibat e Sugra) and the other is long absence (Ghaibat e Kubra). At the end, it probes into the modality of Ghaibat and the matter of Sardaab (cellar), known as cellar of disappearance and answers the doubts regarding it. In this chapter, the secrets behind the Ghaibat, as related by the Ahl-e-Bait (a.s), is explained across seven different titles and at the end it analyses the wisdom behind the absence of Imam Mahdi (a.s). This chapter mentions the effects and genesitic blessings of Ghaibat of Imam Mahdi (a.s), in the light of traditions. The blessings, like survival of the universal order and esoteric (spiritual) guidance of humans. And in the end, a probe which continues to explain these traditions. This section covers subjects under four chapters in regards to, deputyship structure in the time of Imams till Imam Mahdi (a.s), the situation of Islamic society ending up to the long Ghaibat, special deputies of Imam in the short Ghaibat and false claimants of deputyship and Mahdaviyyat. This chapter discusses, the reasons behind establishing this organization by Imams (a.s), its responsibilities, structure, its geographical expanse and names of the deputies which reached us. This talks about the situation of Islamic society before long Ghaibat, into two sub sections. First, it points to the Islamic world during the reign of Abbasids, during the dictatorship of “Al-wathiq billah” till “Al Mu’tamid al-Allah” and then the disintegration of Abbasid empire and Imam’s relationship with statesmen of Bani Abbas. This chapters is dedicated to the general biography of four deputies of Imam Mahdi (a.s), during the short Ghaibat viz. Uthman bin Sa’eed, Mohammed ibn Uthman, Husain ibn Ruh, Ali ibn Mohmmed Saimuri. Fourth chapter deals with important issues, like misuse of fundamental beliefs, motivation of false claimants, grounds which created acceptability, origin of these fake claimants. After this, the history of false Mahdi’s is mentioned. In continuation, the issue of “false claimants of deputyship” is also covered, because of its similarity with “false Mahdi’s”, by mentioning few false claimants of deputyship in the time of short Ghaibat and few in the present time. This section starts with analyzing the letters from Imam Mahdi (a.s) in his short Ghaibat, by quoting the answers of the questions asked to him (a.s), across four chapters. In the fourth chapter, letter addressing to Shaikh Mufeed (r.a) will be analysed with a critical review. Some of the letters from Imam mentioned in this chapter, are related to the beliefs like, attributes of God and some of the letters are related to the political issues; like the letter pertaining to the protection of representatives of Imam (a.s) from the enemies. Some contain both the dimensions, beliefs and politics; like the letter related to Imamat and earth, never being void of proof (Imam). At the end, it mentions the letter to the fourth deputy, regarding the end of short Ghaibat and resumption of long Ghaibat. This chapter deals with the traditions from Imam Mahdi (a.s), where Imam (a.s) has answered many of jurisprudential questions. In continuation it also contains, a comprehensive and expansive analysis regarding the benefits of these traditions. This chapter contains, the letters which point towards the acceptance of Prayer by Imam Mahdi (a.s), or prophecies about some events, that Imam (a.s) has mentioned. Letters which are related to subjects, other than the above chapters, are mentioned in this chapter. This section brings about, the stories of those who met with Imam Mahdi (a.s), before Ghaibat and during his short Ghaibat or long one or those who witnessed extraordinary thing (Karamat) from Imam (a.s). This chapter brings about, sixteen accounts of those who have met with Imam Mahdi (a.s), before Ghaibat. This chapter brings about, 26 accounts of those who were able to meet with Imam Mahdi (a.s), during short Ghaibat. This chapter analyzes the possibility of meeting Imam (a.s), during long Ghaibat and further it mentions about 62 such meetings. This chapter is related to those scholars who were subjected to the special attention by Imam Mahdi (a.s). In this chapter, the author brought sixteen memories of meeting Imam (a.s) by the Shias and Imam (a.s)’s extraordinary acts (Karamat). This section explains the responsibilities of Muslims, especially the followers of Ahl-e-Bait (a.s), across five chapters. These responsibilities are waiting, not being hasty and extreme, persistence, praying and struggle towards forming a global government of Imam Mahdi (a.s). The first chapter, depicts the importance and emphasis given by the Prophet (sws) and Ahl-e-Bait (a.s) and the privileges of those waiting for the re-appearance of Imam (a.s). In the end their analysis has been given for the interested ones. Taking into consideration, the long period of Ghaibat, it has been stressed upon, by the traditions that, those who are waiting must exercise patience and should do act hastily until the grounds are prepared, for the establishment of global government of Imam Mahdi (a.s). These traditions are presented into four titles. During the period of Ghaibat, sticking to the wilayat and religion is a difficult task. Hence, many traditions emphasize on persistence in religiosity in this period. These traditions are divided into six sections in this chapter. A number of traditions from the Prophet (sws) and Imams (a.s), which strongly recommend Muslims to pray for Faraj (expansion of affairs). There are traditions from them as well, which explain the traditions about praying for Faraj. 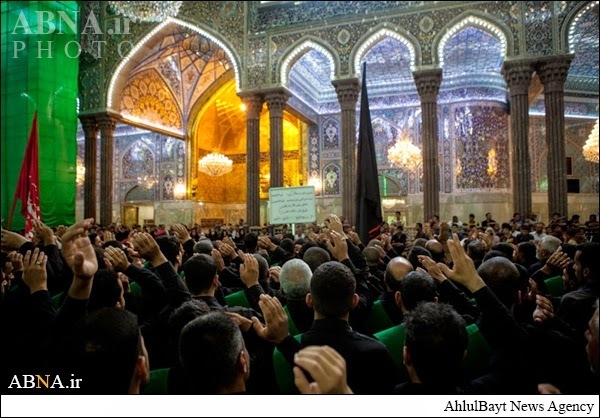 In addition, one of the responsibilities of the followers of Ahl-e-Bait (a.s) during Ghaibat, is to pray for early appearance of Imam (a.s) and expansion of Imam’s affairs. This responsibility is discussed in this chapter in the context of these traditions. Most of these traditions regarding the praying for Faraj, point towards the importance of this particular responsibility. The fifth chapter, starts with stating the tradition regarding those who will prepare the grounds for re-appearance of Imam Mahdi (a.s) and ends with a detailed analysis of the most important duty of Shias in the Ghaibat, i.e. 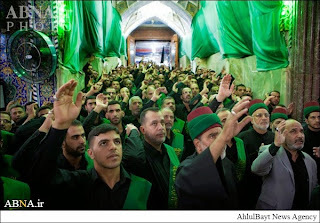 making the grounds for uprising by Imam Mahdi (a.s); but due to misuse of these traditions in the history by the power thirsty, some of these traditions will be discussed along with, the people who will rise before the appearance of Imam Mahdi (a.s) with the flag of evil. This section consists of the prayers related from Ahl-e-Bait (a.s), about Imam (a.s), or the prayers which are narrated by Imam (a.s) himself. Also, the Istekharas which are related to him (a.s) are reported and in the end, method of interceding Imam (a.s) has been stated. It contains 10 chapters. This chapter has the prayers from Imam (a.s)’s father and six ancestors about Faraj. It also mentions the effects and privileges of these prayers. This chapter contains prayers recited by Imam (a.s), during different situations; like during his birth, during Qunoot, near Ka’ba for early realization of Faraj etc. This chapter deals with the prayers that are recommended at the time of four Eids – Fitr, Adh’ha, Ghadeer and Friday. It also contains the analysis of the reference and content of Dua-e-Nudba. This chapter constitutes prayers, which are recommended for everyday of month of Ramadhan, for the day of 13th, 21st and the night of 23rd of this month. Subject of this chapter is, the duas to be recited on Friday, after the prayer of Jafer-e-Tayyar, in the afternoon, in the second sermon of Friday prayer, in the Qunoot of Friday prayer, in the evening and at the time of sunset. This chapter narrates thirteen duas, which are recommended at other days and times. Three prayers, which are recommended for all times, by Imams (a.s) are stated here. In the end we have analyzed the objective of dua for Imam (a.s), meanwhile answering the questions in this regard. This chapter contains 12 duas for different needs, from Imam Mahdi (a.s). The sources which relate the Istekharaas from Imam (a.s), are not authentic; but as these are a type of prayer, reciting them as Raja’ (hope of thawab), has no problem. At the end of this chapter, an investigation into the Istekharaas which are attributed to him (a.s) also exists. The subject of intercession, for fulfillment of the prayers has been discussed in this chapter. After this, it presents the analysis on the topic of writing letter (Ariza), to Imam (a.s) for intercession. This section divides the Ziarat into two chapters, first deals with the Ziarat for Imam Mahdi (a.s) and second deals with the Ziarat which are attributed and quoted from him (a.s). This chapter states, six such texts out of while only one is attributed to Ahl-e-Bait (a.s). The reference of which is assessed in this chapter. It contains three Ziarat texts, attributed to Imam (a.s). 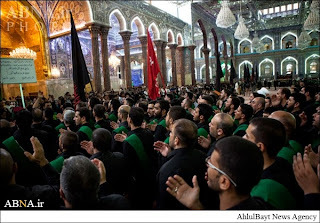 One is the Ziarat of Imam Ali (a.s) which does not have authentic reference. 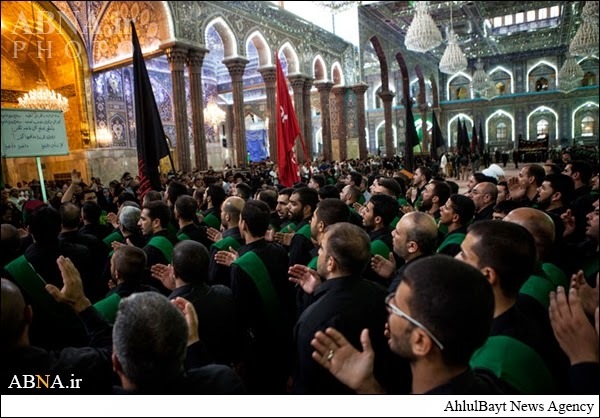 Other two are the Ziarat of the leader of the martyrs Imam Hussain (a.s) on the day of Ashura. Reference of these two are also assessed at the end of this chapter. The traditions narrated in this chapter, relate to the signs which are imminent. Meaning, these signs will definitely be realized before Imam (a.s)’s re-appearance; like emergence of Sufyani, Nafs-e-Zakiyya getting killed, hearing of voice from the skies. This chapter ends with a tradition which indicates the possibility of Bada’ in these signs even though they are attributed as definite. The traditions in this chapter quote the signs which are not imminent. At the end, it gives a detailed analysis of the signs of re-appearance irrespective of definite and non-definite. The return of some of the personalities passed away into this world during the last times, is one of the noetic teachings of Ahl-e-Bait (a.s)’s school of thought and fundamental belief. This astonishing event will also take place, at the time of re-appearance of Imam Mahdi (a.s). Hence this chapter deals with this topic and at the end, a detailed analysis, in the context of which, the proofs from Quran and tradition has been given and the doubts related to this are answered as well. This section, across nine chapters, talks regarding time and place of the uprising, his (a.s) state and attributes during the uprising, his companions, dissension of Christ (a.s) for his (a.s) aid, flag of Imam Mahdi (a.s), his speech at the beginning of uprising and the way he would encounter with the enemies. At the end of this chapter, we will answer the questions, regarding the period of his (a.s) governance and manner of his(a.s) demise. In this chapter, traditions regarding the time of Imam (a.s)’s uprising under ten different sections, are collected, with three different analysis besides it. One tradition regarding, fixing the time of re-appearance and other regarding the uprising taking place in the last times. At the end, an analysis is presented regarding, whether the “Bada’” also concerns the issue of uprising or not. This chapter deals with the tradition related to the place of Mahdavi uprising with its explanation. Based on traditions, Imam (a.s) at the time of uprising is an old person with the features of a young man. Along with these traditions, other traditions are collected in this chapter which, express Imam (a.s)’s body and the clothes. Based on the traditions mentioned in this chapter, the companions are divided into different categories; first: A number of prophets, second: A number of angels, third: A number of those who will come to life again to help the Imam (a.s), fourth: A number of Muslims, from different countries, fifth: A number of those, who haven’t had any benefit at all, explanation of whom is given at the end. Going forward in this chapter, the physical and spiritual attributes, numbers of special and general companions, the role of women in helping Imam (a.s) and at the end, name and home of some of the companions have been mentioned with the analysis on the companions of Imam (a.s), is discussed. This chapter, begins with the traditions about descending of Isa (a.s) from the heavens, and continues with his (a.s) praying behind Imam Mahdi (a.s) and Isa (a.s)’s lifetime after this event with citation from the traditions. 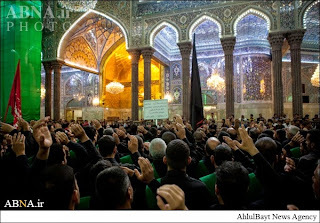 Subject of this chapter is the characteristics of the flag of Imam Mahdi (a.s) during his uprising; for example, it is stated that, this flag is same as the flag of the Prophet (a.s). Also, it is written on it that : “Al-Bai’ato Lillah (Allegiance is only for Allah (swt))”, or “Isma’oo wa A’ti’oo (Listen and obey the command)”. Creating an intense fear in the hearts of enemy, never defeating are some of the other characteristics of this flag. The traditions collected in this chapter, are the speeches of Imam Mahdi (a.s) during the uprising. The reports in this chapter, tell us about the strict and decisive behavior of Imam Mahdi (a.s) not only with, arrogant and unjust powers, but with false claimants of Shii’sm and that he (a.s) would root out the sedition and corruption from the world. In the end of this chapter, the traditions regarding the massacre of people will be scrutinized and reviewed. In the last chapter of this section related to the uprising, questions related to the time frame of his (a.s) governance, and the end of his (a.s) blessed life will be answered. 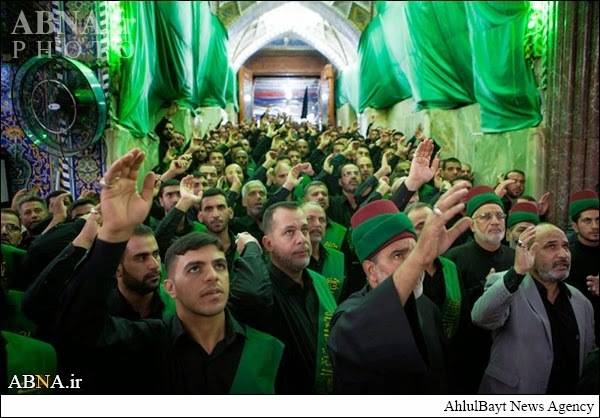 In this section, traditions regarding the methodology of governance of Imam Mahdi (a.s), and its cultural, social, economic and judicial policies are explained across six chapters with the analysis at the end. In the first chapter, traditions related to the fundamentals of governance of Imam Mahdi (a.s) and its policies are categorized into three parts. First: Traditions which define these fundamentals referencing to the book of God. Going forward, the meaning of the book that Imam Mahdi (a.s) would bring will be explained. Second: Traditions which define these fundamentals referencing to the method of the Prophet (sws). Third: Traditions which depict the method of Imam Mahdi (a.s), as a values of Islam. It’s obvious that, these values are compatible with what has been said in the first and second category. This chapter is about the main and decisive policies in the government of Mahdi (a.s), like fight against oppression and wide spread of global justice. In this chapter, based on the traditions from Prophet (sws) and Imams (a.s), the spread of global justice and its spread in the individual and social life will be explained. This chapter depicts the cultural policies of Imam Mahdi (a.s)’s government; like spread of the horizons of knowledge, teaching of Quran based on its revelation, construction of huge Masjids, fight against innovation in the religion, destroying the strongholds of astray, deepening and perfection of faith, revival of earth by knowledge, faith and justice and at last terminating the dominion of Satan and spread of power of Islam and single religion across the globe. This chapter, begins with the traditions which clearly specify that, the social relations in the government of Mahdi, are based on the religious brotherhood. Then, it explains the widespread security, development of hygiene and health, road development and implementation of the traffic rules. The most important point, about these policies is that, not only the people of earth, but the inhabitants of heaven will also be satisfied with the government of Mahdi (a.s). Thus the blessings of God will be universal. The main economic policies, pointed out by the traditions in this chapter are, eradication of poverty, taking back of the public property from illegal occupiers, using the hoarded wealth by rich in the uprising, division of public wealth among them uniformly, developing of all lands. In the end, it is pointed out that, with the implementation of these policies, the blessings will be widespread, the treasures of earth will manifest itself and in such a time is when, anyone can ask for anything from Imam (a.s) and his (a.s) grants will be unlimited. The main judicial policies, pointed out by the traditions in the sixth chapter of this section are, a new judicial constitution, judgment based on reality, availability of facilities for precise and quick judgment, sidelining the inappropriate judgment, selection of right judgment, rooting out of bribery, judgment by women inside the house and judgment among the followers of the book by their own books. At the end, the expansive analysis of these policies has been given. In the beginning, we brought the analysis regarding the developments in the poems related to Imam Mahdi (a.s). Then, the poems written from the first century till now are mentioned, across fifteen chapters. It’s interesting to know that, because, till the end of fifth century, we did not find a poem in Farsi, so we brought the poems of first five centuries, in Arabic language with its translation. This section, after a brief explanation of writings of Mahdaviyyat in different parts of the history, the most important of these works are accounted in the two chapters. In this chapter, the books are mentioned in the sequence of century of publication, from the third century; as from the first and second century, no work has been recorded. In each century, first the existing works are mentioned and then the missing works will be introduced. In the end, diagrams of these works with the authors and their religious accounts are presented. After the 12th century, especially in the contemporary times, because of different reasons, the writings on the subject of Mahdaviyyat have been on steep rise. These works can be divided into few general groups: 1. Compilation of plenty of treatise and books; 2. Critical and self-interested works; 3. Compilation of university thesis; 4. Journals dedicated to this topic; 5. Compilation of encyclopedias on this topic. This chapter overall revolves around, explaining these topics. دارالحديث تشتمل هذه الموسوعة على مقدّمة وأربعة عشر قسماً وسبعين فصلاً . وتبحث خلالها مختلف المسائل المتعلّقة بالقضیّة المهدويّة استناداً إلى النصوص الإسلاميّة المعتبرة (نصّ الآيات والأحاديث). صدرت حديثاً موسوعة الإمام المهدي (عليه السلام) على أساس القرآن والحديث والتأريخ على يد مركز أبحاث العلوم والمعارف الحديثيّة لمؤسّسة دارالحديث العلميّة الثقافيّة وقد أزيح الستار عنها منتصف شهر شعبان المبارك بحضور سماحة القائد الأعلى للثورة الإسلاميّة في إيران . نقلنا في هذا الفصل الآيات والأحاديث التي تؤكّد على حضور إمام وحجّة إلهيّة في الأرض منذ تشكيل المجتمعات البشريّة حتّى نهاية العالم وهي تدلّ على أنّ الأئمّة بعد الرسول الخاتم (صلّى الله عليه وعلى آله) من ذريّته . تدرس هذه الأحاديث وتتمّ الإجابة على بعض الشبهات حولها في نهاية الفصل. تمّ في هذا الفصل إثبات قضيّة استمرار إمامة وقيادة الأمّة في نسل النبي الخاتم (صلّى الله عليه وعلى آله) حتّى القيامة استناداً إلى حديث الثقلين المتواتر والمتّفق عليه بين السنّة والشيعة . ونهاية الفصل يشتمل على دراسة مكثّفة وشاملة يبحث فيها حول أسانيد الحديث ودلالته على عصمة أهل البيت (عليهم السلام) ومرجعيّتهم العلميّة بين الأمّة الإسلاميّة ، وإمامة الإمام المهديّ (عج) وغيبته وتذكر خلاله بعض النقاط المهمّة الأخرى حول الحديث الشريف. ذكرنا في بداية الفصل عدداً كثيراً من الأحاديث التي يعرّف الرسول (صلّى الله عليه وعلى آله) القادة بعده وبمختلف التعابير وبعد ذلك تطرّقنا إلى البحث حول أسانيد هذه الأحاديث ووقت صدورها ومكان الصدور والاختلاف بين نصوصها والمقصود منها والنظريّات المطروحة حولها ومن ثمّة يتمّ إثبات أنّ كلّ تلك الأحاديث لا تطابق إلّا عقيدة أتباع أهل البيت التي تعتقد بإمامة أهل بيت الرسالة. يتبيّن خلال هذا الفصل أنّ على المسلمين معرفة قائدهم الإلهيّ الذي هو من أهل بيت الرسول (صلّى الله عليه وآله) ويأتي بعد ذلك فضل معرفة القائد ومخاطر عدم معرفته كما جاء فيه الروايات الناهية عن إنكار إمامة أئمة أهل البيت (عليهم السلام) خصوصاً الإمام الثاني عشر. كما قدّمنا دراستين في هذا الفصل الأولى حول وجوب معرفة الإمام في كلّ عصر، والأخرى حول وظيفة من لا يقدر على معرفته . موضوع هذا الفصل هو الإشارات والبشائر المذكورة في بعض الآيات القرآنيّة والتنبّؤات حول انتشار الإسلام وتشكيل حكومة الصالحين وإمامة المستضعفين. وينتهي الفصل بالبحث حول الآيات التي تشير إلى الحكومة العالميّة للإمام المهديّ (عليه السلام). ذكرنا النصوص المصرّحة بكون الإمام المهديّ (عليه السلام) من أهل بيت الرسول وعترته (صلّى الله عليه وعلى آله) وننقل الأحاديث التي تعرّف تفصيلاً أسلاف الإمام (عليه السلام) ونظراً إلى اعتقاد معظم أهل السنّة بأنّ نسب المهديّ (عليه السلام) يعود من خلال الإمام الحسن (عليه السلام) إلى النبي (صلّى الله عليه وعلى آله). ونثبت من خلال بحث أنّ الإمام من أحفاد الإمام الحسين (عليه السلام). وفي نهاية المطاف بحث حول والدة الإمام المهديّ (عليه السلام). يدور البحث في هذا الفصل حول تأريخ مولد الإمام المهديّ (عليه السلام) وكيفيّة ولادته والأمور المتعلّقة بهذه القضيّة. كذلك يشتمل الفصل على ثلاثة أبحاث: الأوّل حول زمن الولادة ومكانها، الثانيّ: حول نشأة الإمام ونموّه غيرالاعتياديّ والثالث: حول تكلّمه بعد الولادة. يعدّد هذا الفصل أسماء الإمام المهديّ (عليه السلام) وكناه وألقابه ويثبت من خلال بحث بطلان ما ورد في مصادر أهل السنة الحديثيّة في كون أبي الإمام سميّاً للنبيّ (صلّى الله عليه وعلى آله) وأنّ ذلك يعارض عقيدة أتباع أهل البيت (عليهم السلام). وفي دراسة أخرى نواجه روايات تمنع من التفوّه باسم الإمام (عليه السلام). البحث الثالث يدور حول القيام عند ذكر اسم الإمام المهديّ (محمّد) أو لقبه (القائم) احتراماً والبحث الأخير في الفصل يتعلّق بلقب أباصالح. يستعرض هذا الفصل أربعة عشر خصوصيّة جسميّة وظاهريّة في الإمام على أساس الأحاديث التي تبيّن مظهر الإمام وسيماه. في بداية الفصل تمّ بيان الأحاديث المتعلّقة بطول عمر الإمام المهديّ (عليه السلام) ضمن ثلاثة أصناف كما جرى البحث في دراسة في نهاية الفصل حول الأدلّة الثبوثيّة والإثباتيّة المتعلّقة بطول عمره الشريف. جمعنا في هذا الفصل عدداً من أبرز خصائص الإمام المهديّ (عليه السلام) على أساس الأحاديث وهي عبارة عن: شبهه إلى بعض الأنبياء، شبهه بذي القرنين، شبهه الكبير إلى النبي الخاتم (صلّى الله عليه وعلى آله)، التفوّق على جميع الأئمّة إلّا أمير المؤمنين (عليهم السلام)، الحضور في موسم الحجّ كلّ عام، سيادة أهل الجنّة ويأتي في نهاية البحث توضيح حول سادة أهل الجنّة. من الضروريّ وخصوصاً للجيل الشابّ الإطّلاع على الإجابة الصحيحة للشبهات التي قد طرحت حول الإمام المهديّ (عليه السلام) خصوصاً في العصر الحاضر. وقد أجيب في هذه الموسوعة على عدد من الأسئلة المتناسبة مع كلّ بحث ضمن مباحث مختلفة. ولذلك اكتفي هنا بما لم يتمّ ذكره في الفصول السابقة مثل كيفيّة الإمامة في الصغر، مسألة زواج الإمام المهديّ (عليه السلام) والأماكن المنسوبة إلى الإمام كالجزيرة الخضراء. 3.1 التنبّؤات حول الغيبة: أحد الإجراءات التي اتّخذها النبيّ (صلّى الله عليه وعلى آله) وأهل بيته (عليهم السلام) تمهيداً للقبول بموضوع غيبة الإمام المهديّ (عليه السلام) هو تنبّؤاتهم حول هذه الواقعة العظيمة. لذلك قدّمنا دراسة شاملة حول أهمّ ما قام به أهل البيت (عليهم السلام) في سبيل ذلك. وبعد ذلك ذكرنا تنبّؤات الرسول (صلّى الله عليه وعلى آله) وأجداد الإمام المهديّ (عليهم السلام): من قبيل الأحاديث التي تقسّم غيبة الإمام إلى فترتين قصيرة وطويلة. إضافة إلى بحث في نهاية الفصل حول كيفيّة غيبة الإمام التي تشمل توضيحات حول سرداب الغيبة وإجابات حول ما ورد عليه من شبهات. 3.2 فلسفة الغيبة: بيّننا خلال هذا الفصل النقاط التي أشار إليها أهل البيت حول السرّ في غيبة الإمام المهديّ (عليه السلام) ضمن سبعة عناوين كما جاء بحث حول فلسفة الغيبة في نهاية الفصل. 3.3 بركات الغيبة: تمّ بيان آثار الإمام الغائب وبركاته التكوينيّة من منظور الأحاديث، وهي من قبيل استمرار نظام العالم والهداية الباطنيّة للناس كما انتهى الفصل ببحث في بيان جميع هذه الأحاديث. 4.1 نظام الوكالة: جاء في هذا الفصل مسائل مثل دلائل تشكيل وتوسعة نظام الوكالة من قبل الأئمّة، ووظيفة نظام الوكالة، وتشكيلة نظام الوكالة، ونطاقه الجغرافيّ، وأسماء عدد من الوكلاء ممّا وصل إلينا. القسم الأوّل: العالم الإسلاميّ على أعتاب الغيبة الصغرى. أشير في هذا الفصل إجمالاً إلى الخلاف المنتشر بين العبّاسيّين منذ حكم الواثق بالله إلى فترة حكم المعتمد على الله وبعد ذلك انقسام الدولة العبّاسيّة وموقف الأئمة من الحكّام العبّاسيّين. القسم الثاني: العالم الإسلاميّ أيّام الغيبة الصغرى. ارتسمت في هذا القسم أجواء العالم الإسلاميّ أيّام الغيبة الصغرى ـ المقارنة لخلافة ستّة من بني العبّاس ـ وأشير فيه إلى الأحداث السياسيّة المهمّة في تلك الفترة. وبعده تمّ بيان طريقة تعامل الحكّام العبّاسيّين مع الشيعة والأوضاع العلميّة والثقافيّة للعالم الإسلاميّ في هذه الفترة وكذلك نشاطات أتباع مدرسة أهل البيت. وفي نهاية المطاف أشير إلى كبار علماء الشيعة في عصر الغيبة الصغرى. 4.3 النوّاب الخواصّ: يختصّ هذا الفصل بشرح إجماليّ لنوّاب الإمام المهديّ (عليه السلام) الخواصّ في فترة الغيبة الصغرى هم حسب الترتيب التالي: عثمان بن سعيد العمريّ، ومحمد بن عثمان العمريّ، وحسين بن روح النوبختيّ، وعليّ بن محمد السمريّ. 4.4 مدّعوا المهدويّة كذباً: تطرّق هذا الفصل إلى مسائل مهمّة من قبيل إساءة استخدام المفاهيم الأصيلة، مدّعوا المهدويّة كذباً، أرضيّات قبول دعوى مدّعي المهدويّة، ومنشأ هؤلاء. وبعد ذلك تاريخ المدّعين للمهدويّة كذباً وبالمناسبة ذكرنا موضوع مدّعي الوكالة كذباً وعدّدنا بعضهم في عصر الغيبة الصغرى والعصر الحاضر. 5.1 التوقيعات الاعتقاديّة والسياسيّة: بعض التوقيعات المذكورة في هذا الفصل تتعلّق بعقائد من قبيل الصفات الإلهيّة، وعدد منها بالموضوعات السياسيّة مثل التوقيع حول حفظ ممثّلي الإمام من كيد الأعداء، والبعض منها يشتمل على الجانبان السياسيّ والاعتقاديّ مثل التوقيعات المرتبطة بالإمامة وعدم خلوّ الأرض من الحجّة وجاء في نهاية الفصل رسالة الإمام المهديّ (عليه السلام) إلى رابع النوّاب الخواصّ حول بداية الغيبة الكبرى. 5.2 التوقيعات الفقهيّة: ننقل في بداية الفصل أحاديث أجاب فيها الإمام على عدد من المسائل الفقهيّة ويأتي بعد ذلك دراسة مبسوطة وشاملة حول مضمون هذه الأحاديث. 5.3 التوقيعات حول كرامات الإمام: ذكرت في هذا الفصل توقيعات حول استجابة دعوة الإمام المهدي (عليه السلام) وتنبّؤه حول بعض القضايا. 5.4 توقيعات متنوعة: اشتمل هذا الفصل على ما لا يندرج تحت العناوين السابقة. 6.1 ملاقات الإمام (عليه السلام) قبل الغيبة: عدّد هذا الفصل ستة عشر تقريراً حول ملاقاة الإمام المهديّ (عليه السلام) قبل الغيبة. 6.2 ملاقاة الإمام أيام الغيبة الصغرى: ست وعشرون تقريراً حول من نال التوفيق في زيارة الإمام. 6.3 ملاقاة الإمام أيام الغيبة الكبرى: يبدأ هذا الفصل بدراسة حول إمكانيّة ملاقاة الإمام في فترة الغيبة الكبرى وبعد ذلك يذكر إثنين وستين مورداً منه. 6.5 ذكريات المؤلف: الفصل الأخير من القسم يذكر سبعة عشر تقريراً من المؤلّف (سماحة الشيخ ري شهري) حول ملاقاة الشيعة مع الإمام المهدي (عليه السلام) أو مشاهدة كرامة من قبله (عليه السلام). 7.1 الإنتظار: يدور البحث في الفصل الأوّل من هذا القسم حول ترغيب النبي الأكرم (صلى الله عليه وعلى آله) وأهل بيته الناس لانتضار ظهور الإمام المهديّ (عليه السلام) وبيان قيمة وأهميّة الانتظار وفضيلة المنتظرين للظهور. وبعد ذلك تحليل حول الإنتظار. 7.2 الصبر: نظراً إلى طول فترة غيبة الإمام المهديّ (عليه السلام) أكّدت الكثير من الأحاديث على لزوم تصبّر المنتظرين في هذه الفترة واجتناب الاستعجال حتّى حصول الأرضيّة اللازمة لتشكيل الدولة الإسلاميّة العالميّة وتمّ تصنيف هذه الأحاديث في أربعة أصناف. 7.3 الثبات: التمسّك بولاية الإمام المهديّ والتديّن يكون أمراً بالغ الصعوبة أيّام غيبة الإمام المهدي (عليه السلام) ولذلك أشادت الكثير من الأحاديث على الثبات في الدين في هذه الفترة وهي مصنّفة خلال ستّة أصناف. 7.4 الدعاء للفرج: وصلتنا من النبي الأكرم (صلى الله عليه وعلى آله) وأهل بيته (عليهم السلام) الكثير من التوصيات وحثّ المسلمين على طلب الفرج من الله. ونقلت أدعية عنهم وذكرناها تفصيلا في هذا الفصل. إضافة إلى ما تقدّم، إنّ أحد وظائف أتباع أهل البيت (عليهم السلام) في فترة الغيبة هي الدعاء لتعجيل فرجه وظهوره وهي موجودة في أحاديث هذا الفصل. وكثرة ما نقل من الأحاديث لتعجيل الفرج يبيّن أهميّة هذا الواجب. 7.5 التمهيد: يبدأ الفصل الخامس بأحاديث حول التمهيد لقيام الإمام المهديّ (عليه السلام) و دراسة شاملة حول أهمّ وظائف الشيعه في عصر الغيبة وهي التمهيد لقيامه ونظراً إلى تعرّض بعض هذه الأحاديث لسوء الاستعمال من قبل أصحاب السلطة والقوّة فقد قمنا بدراسة نقديّة وتحليليّة حول الجماعة التي تقوم قبل ظهور الإمام المهدي (عليه السلام) برايات سود. 8.1 أدعية والد الإمام وأجداده: نقلنا في هذا الفصل أدعية والد الإمام (عليه السلام) وستة من أجداده (عليهم السلام) لفرجه وكذلك الآثار والبركات التي تترتّب عليه. 8.2 أدعية الإمام: يختصّ هذا الفصل بأدعية الإمام في حالاته المختلفة: مثل دعائه حين الولادة وفي القنوت وجنب الكعبة لتحقّق أمر الفرج. 8.3 الدعاء للإمام أيّام العيد: نتطرّق في هذا الفصل إلى الأدعية التي ينبغي قراءتها في الأعياد الأربعة ـ الفطر والأضحى والغدير والجمعة ـ وكذلك دراسة حول سند ونصّ دعاء الندبة. 8.4 الدعاء للإمام في شهر رمضان: جمعنا فيه ما ينبغي قراءته من الدعاء في كلّ يوم من شهر رمضان وفي اليوم الثالث عشر منه و الحادي والعشرين والثالث والعشرين. 8.5 دعاء يوم الجمعه: موضوع هذا الفصل هو الأدعية التي حثّ على قراءتها في يوم الجمعة بعد صلاة جعفر الطيّار، وبعد ظهر يوم الجمعة وفي الخطبة الثانية من صلاة الجمعة وفي قنوت صلاة الجمعة و بعد العصر يوم الجمعة وعند غروب الشمس من يوم الجمعة. 8.6 الدعاء للإمام (عليه السلام) في سائر الأوقات: ذكرنا ما يجدر الدعاء به في سائر الأيّام والأوقات. 8.7 الدعاء للإمام في كلّ حال: ثلاث أدعية أوصى بها المعصومون (عليهم السلام) لتقرأ في كل حال وفي الختام قمنا بدراسة حول المقصود من الدعاء للإمام والإجابة على بعض الأسئلة في هذا الصدد. 8.8 الأدعية المأثورة عن الإمام المهديّ (عليه السلام): نقلنا اثنى عشر دعاءاً عن الإمام المهديّ (عليه السلام) لقضاء حاجات مختلفة. 8.9 الاستخارة: نسبت المصادر استخارات إلى الإمام المهدي (عليه السلام) ممّا لا اعتبار بسنده، ولكن بما أنّه يعتبر دعاءاً فلا مانع من استعماله رجاءاً للإستجابة. وبعد ذلك تأتي دراسة حول الاستخارات المنسوبة إليه (عليه السلام). 8.10 التوسّل: طرحت مسألة التوسّل بالإمام المهديّ (عليه السلام) لإجابة الأدعية في هذا الفصل وقدّمنا بعد ذلك دراسة حول التوسّل به من خلال كتابة العريضة (رسالة طلب أو شكوى). 9.1 زيارات الإمام المهديّ عليه السلام: ذكرنا في هذا الفصل ستّ زيارات للإمام المهديّ (عليه السلام) حيث أنّ أحدها ـ و هو زيارة آل ياسين ـ مأثور عن أهل البيت عليهم السلام. وبعد ذلك قيّمنا سند هذه الرواية. 9.2 الزيارات المنسوبة إلى الإمام: تمّ تقرير ثلاث زيارات منسوبة إلى الإمام المهديّ (عليه السلام): أحدها هو زيارة أمير المؤمنين التي لا تتمتّع بسند معتبر، والأخرى هي زيارة سيّد الشهداء في يوم عاشوراء وقد جاء تقييم لاعتبار سندهما في دراسة نهاية الفصل. 10.1 العلامات المحتومة: الأحاديث المنقولة هنا هي حول العلائم المسمّاة بالمحتومة، أي العلامات التي تحدث قبل الظهور قطعاً، مثل خروج السفياني وقتل النفس الزكيّة والصيحة السماويّة وفي آخر الفصل ذكرنا حديثاً حول إمكانيّة حصول البداء في علامات الظهور حتّى في مورد العلامات المحتومة. 10.2 العلامات غير المحتومة: اشتمل هذا الفصل على العلامات التي لا تتّصف بالحتميّة حول ظهور الإمام. وجاء في خاتمة الفصل تحليل مبسوط حول علائم الظهور المحتومة وغير المتحتومة. 10.3 الرجعة: أحد المعارف التي وصلتنا عن طريق مدرسة أهل البيت عليهم السلام هو رجعة عدد من الموتى إلى الحياة في آخر الزمان. فبناءاً على الأحاديث سوف تحدث هذه الواقعة المدهشة مقارنة لقيام الإمام المهديّ (عليه السلام). لذلك خصّصنا الفصل الثالث من علامات الظهور بذلك وفي الختام قدّمنا دراسة مفصّلة حول الدلائل القرآنيّة والحديثيّة الدالّة على الرجعة وأجبنا على بعض الشبهات المطروحة حوله. 11.2 مكان قيامه: بعض التوضيحات حول مكان قيامه (عليه السلام). 11.3 صفات الإمام حين القيام: حسب ما جاء في الروايات فإنّ الإمام حين الظهور شيخ على هيئة شابّ كما ذكرت له خصائص وصفات جسميّة وظاهريّة ما جمعناه هنا. 11.4 أصحاب الإمام: حسب أحاديث هذا الفصل فإنّ أصحاب الإمام هم عدّة مجموعات: مجموعة من الأنبياء وأخرى من الملائكة وآخرين يعودون إلى الحياة لنصرة الإمام، وكذلك جمع من المسلمين من مختلف أقطار الأرض وآخرون ممّن لا نصيب له من الخير وذكر توضيح حول المجموعة الأخيرة. كما جاء بعده بعض الخصائص الجسميّة لأصحاب الإمام وعدد من خاصّة أنصاره والعامّة منهم وكذلك دور النساء في نصرة الإمام وأخيراً أسماء ومواطن عدد من أصحاب الإمام مع دراسة حول الأصحاب. وفي نهاية الفصل استعرضنا كيفيّة اجتماع أصحاب الإمام وشروط بيعته وعدد هؤلاء ومعدّاتهم الحربيّة وإمكانيّاتهم لدعم وإسناد قوّات الإمام. 11.5 عيسى بن مريم إلى جانب الإمام عليهما السلام: يبدأ هذا الفصل بأحاديث حول كيفيّة نزول عيسى (عليه السلام) من السماء لنصرة الإمام المهديّ وإقامته للصلاة خلف المهديّ و طول عمره الشريف استناداً إلى الأحاديث. 11.6 راية الإمام: يختصّ موضوع هذا الفصل براية الإمام المهديّ (عليه السلام) حين القيام فمثلاً هناك من الأخبار ما ينصّ على أنّ رايته راية رسول الله (صلّى الله عليه وعلى آله) وقد كتب عليها (البيعة لله) أو (اسمعوا وأطيعوا). ومن سائر خصائص هذه الراية هي إلقاء رعب شديد في قلوب الأعداء وأنّها لا تهزم ولا تقع أبداً. 11.8 مواجهة أعداء الإسلام: يتبيّن من خلال هذا الفصل أن الإمام المهدي (عليه السلام) ليس يواجه المستكبرين والظالمين فحسب وإنّما يواجه مدّعي التشيّع كذباً ويقلع جذور الفتنة والفساد من العالم. وندرس في هذا الفصل الأحاديث التي تدلّ على عمليّة القتل الواسع بين الناس عند قيام المهديّ (عليه السلام) ونقيّمها. 11.9 الإجابة على بعض التساؤلات: نجيب خلال الفصل الأخير من قيام الإمام المهدي (عليه السلام) إلى بعض الأسئلة حول مدّة حكم الإمام وكيفيّة وفاته سلام الله عليه. الأوّل: الأحاديث التي تعرّف سيرة الإمام في الحكم على أنّها تستند إلى كتاب الله عزوجلّ . وبعد ذلك سوف نوضّح بأنّه ما المراد بالكتاب الجديد الذي يأتي به الإمام المهدي (عليه السلام). الثانيّ: الأحاديث التي تنصّ على استناد سيرة الإمام في الحكم على السنّة النبويّة الشريفة. الثالث: الأحاديث التي تعتبر إحياء القيم الإسلاميّة مبدءاً ومقصداً للسيرة المهدويّة في الحكم ومن البديهيّ أنّ هذه القيم تطابق مضمون الصنفين الأوّل والثاني المتقدّمين. 12.2 السياسات الرئيسيّة: يتركّز البحث في هذا الفصل على أهمّ السياسات المصيريّة في الحكومة المهدويّة وهي مكافحة الظلم وبسط العدل والقسط في أرجاء العالم. يتمّ في هذا الفصل التوضيح حول العدل العالميّ ونطاق العدالة في حكم الإمام على الصعيد الفرديّ والاجتماعيّ إستناداً إلى روايات صادرة عن النبي صلى الله عليه وعلى آله والأئمة عليهم السلام. 12.3 السياسات الثقافيّة: عدّدنا في هذا الفصل بعض السياسات الثقافيّة في حكومة الإمام المهديّ (عليه السلام) مثل سياسة توسعة حدود العلم وتعليم القرآن حسب ترتيب النزول وبناء المساجد الواسعة ومواجهة البدع وهدم مراكز الإضلال وتعميق الإيمان وإكماله وإحياء الأرض بالعلم والإيمان والعدل وإنهاء حكم الشيطان وانتشار الحكومة الإسلاميّة في أرجاء الأرض ووحدة الأديان. وتأتي في نهاية الفصل دراسة حول مواجهة الإمام لسائر الأديان السماويّة وأتباعها. 12.4 السياسات الاجتماعيّة: يبدأ هذا الفصل بحديث يصرّح بأنّ العلاقات الاجتماعيّة في الدولة المهدويّة تقوم على أساس الأخوّة الدينيّة. وتطرح بعد ذلك مفاهيم الأمان الشامل والتقدّم والصحّة والطبّ وتوسعة الطرق وإجراء قوانين المرور. وأهمّ النقاط هي أنّ سياسات الإمام المهديّ (عليه السلام) الاجتماعيّة تكون بحيث أنّه ليس أهل الأرض فحسب وإنّما أهل السماء كذلك سوف يرضون عن حكمه وبذلك تغمر البركات الإلهيّة أرجاء العالم. 12.5 السياسات الاقتصاديّة: أهمّ السياسات الاقتصاديّة في الحكومة المهدويّة ممّا أشير إليها في أحاديث هذا الفصل هي: استئصال الفقر واستعادة الأموال العامّة من غاصبيها واستخدام ثروات الأثرياء في بداية قيام المهديّ (عليه السلام) وتقسيم الأموال العامّة بين الناس على سواء، وإعمار كافّة أرجاء الأرض، و أخيراً أشير إلى أنّه من خلال هذه السياسات سوف تعمّ البركات الإلهيّة المجتمع وتخرج الأرض كنوزوها وفي هذه الظروف الكلّ يستطيع أن يسأل الإمام ما يشاء وسوف يهب الإمام للسائلين بغير حساب. 12.6 السياسات القضائيّة: أهمّ السياسات القضائيّة في الحكومة المهدويّة التي أشير إليها في أحاديث الفصل السادس هي النظام القضائيّ الجديد، والقضاء على أساس العلم، وتوفير الإمكانيّة اللازمة للقضاء السريع والدقيق، وفصل القضاة غير المؤهّلين، واختيار قضاة صالحين، واستئصال الارتشاء، وقضاء النساء في البيت، والقضاء بين أتباع الديانات على أساس كتبهم السماويّة ونقدّم في نهاية الفصل دراسة مفصّلة حول سياسات الحكومة المهدويّة. قدّمنا في بداية هذا الفصل دراسة حول تطوّر الشعر المهدويّ (الأشعار التي دوّنت حول الإمام المهديّ مدى التأريخ الإسلامي). ويأتي بعد ذلك نماذج من> الأشعار المهدويّة منذ القرن الأوّل وحتّى يومنا وجدير بالذّكر أنّنا لم نجد حتّى نهاية القرن الخامس أشعاراً باللغة الفارسيّة فقدّمنا في الفصول الخمسة الأولى نماذج من الأشعار العربيّة مع ترجمتها إلى الفارسيّة. 14.1 الكتابة حول المهدويّة: يعرّف بالكتب في هذا الفصل على ترتيب زمن التأليف بداية من القرن الثالث: لأنه لا يوجد في القرن الأوّل والثاني أيّ أثر للتأليف في المصادر المرتبطة بالبحث. ثم نشير في كلّ فصل أوّلاً إلى الآثار الموجودة وثمّ إلى الآثار المفقودة. ونقدّم في النهاية تخطيطاً للآثار والمؤلّفين وميولهم المذهبيّة. المجلّات الموضوعيّة، الخامسة: تأليف المعاجم والموسوعات. On the auspicious occasion of the birth anniversary of the deliverer of the world (the Messiah), Imam Mahdi (a.s), the leader of revolution, visited the exhibition on the intellectual and research works of the Dar al-Hadith Research Institute. During this visit, the encyclopedia on Imam Mahdi (a.s), which is a result of efforts by the institute, has also been presented. 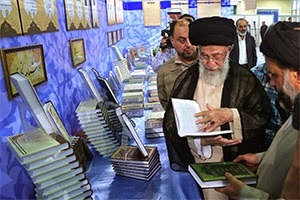 HadithNet, as stated from the office of Ayatullah Khamenei (ha), the leader of revolution, after this visit, in the speech among the teachers, researchers, authorities and employees of Dar al-Hadith Institute, alongside expressing the gratitude on compiling this encyclopedia, quoted it as a great example of identifying the shortcomings in this field of research and as a valuable gift to the Islamic and scientific community, further reiterating: "The issue of Mahdaviat and the re-appearance of the Imam of the Age (may God hasten his re-appearance) is God’s definite promise. Fulfilling the promises which have been given to mankind in the course of history is in fact, a kind of assurance to humans. So, this great promise will definitely be fulfilled as well." His Eminence stressed that the caravan of mankind will witness a promising end, saying: "The wait for the re-appearance of the Imam of the Age (a.s.) will be a promising and revitalizing wait. The spirit of waiting is one of the greatest gates of salvation for the Islamic community." At the end, His eminence appreciated Hujjat al-Islam Raishahri, teachers and scholars of the institute, for preparing the encyclopedia on Imam Mahdi (a.s). After the speech of the leader of revolution, Hujjat al-Islam Mohammadi Raishahri, head of the Dar al-Hadith scholastic cultural Institute, in a report with the unveiling of the encyclopedia at this auspicious occasion, referred to some important characteristics of encyclopedia viz. revalidating the sources; widespread references including that of Shias and Sunnis; review and assessment of non-traditional proofs on Mahdaviyat; comprehensiveness and selective writing; containing explanation, analysis as well as critical analysis of other views; explication of beliefs of other religions regarding Messiah (expected deliverer); summarization and analysis of conflicting views; answering of questions and doubts; and warning regarding the inclination towards superstitions. على أعتاب الذكرى العطرة لولادة منقذ الإنسانية سيدنا الإمام المهدي المنتظر (عج) زار سماحة قائد الثورة الإسلامية يوم الأربعاء 11/06/2014 م معرض النتاجات العلمية و البحثية لمؤسسة دار الحديث. و قد عرضت أثناء هذه الزيارة موسوعة الإمام المهدي (عج) التي جرى إعدادها من قبل مؤسسة دار الحديث. بعد هذه الزيارة تحدث قائد الثورة الإسلامية في اجتماع للأساتذة و الباحثين و المسؤولين و العاملين في مؤسسة دار الحديث و مركز بحوث القرآن و الحديث فشكر تدوين موسوعة الإمام المهدي (عج) و اعتبرها نموذجاً بارزاً لتشخيص الثغرات و القضايا اللازمة بشكل صحيح، و هدية قيمة للمجتمع الإسلامي و المجتمع العلمي على أعتاب عيد النصف من شعبان الكبير، و أضاف قائلاً: موضوع المهدوية و ظهور الإمام صاحب الأمر و الزمان (عج) وعد إلهي قاطع، و تحقق الوعود المعطاة للبشرية على مرّ التاريخ هو في الواقع نوع من تطمين البشر بأن ذلك الوعد الكبير أيضاً سيتحقق حتمياً. و أشار قائد الثورة الإسلامية في هذا الخصوص إلى نموذج قرآني قائلاً: في القرآن الكريم عندما تروى قصة طفولة النبي موسى (ع) يعطي الله أمّ موسى وعدين. الوعد الأول هو أنه سيردّ هذا الطفل الذي ألقته في الماء إليها، و الوعد الثاني هو أنه سيجعله رسولاً. و نوّه آية الله العظمى السيد الخامنئي: تحقق الوعد الأول من قبل الله تعالى خلال مدة قصيرة كان في الواقع طمأنة بتحقق الوعد الثاني في سنين لاحقة. و أشار سماحته إلى أن الاعتقاد بالإمام المهدي المنتظر (عج) و مآل مسيرة قافلة البشرية في هذه الدنيا من الجوانب المهمة في الرؤية الكونية للأديان الإلهية، مردفاً: تؤمن كل الأديان الإلهية بأن قافلة البشرية ستصل في نهاية الدرب إلى منزل منشود محبوب مطلوب خصوصيته الأهم هي العدالة. و قال سماحته: قافلة البشرية سارت منذ فجر الخلقة في طريق ملئ بالمنعطفات و الأشواك و الوحول لتصل إلى طريق سهل منفتح، و هذا الطريق السهل هو فترة ظهور الإمام المهدي المنتظر (عج). و أكد قائد الثورة الإسلامية على أن تحقق الظروف الإيجابية في فترة ظهور الإمام المهدي المنتظر (عج) لن تكون دفعية و فجائية، ملفتاً: في تلك الفترة أيضاً سيستمر النزاع بين الخير و الشر في طبيعة البشر، و سيكون هنالك أفراد أشرار إلى جانب الأفراد الصالحين، غير أن ظروف تلك الفترة ستكون بحيث تتوفر الأرضية بدرجة كبيرة لصلاح البشر و تحقق العدالة. و وصف آية الله العظمى الإمام الخامنئي نهاية درب قافلة البشرية بأنها باعثة على كثير من الأمل، مؤكداً: انتظار الفرج انتظار باعث على الأمل و مانح للقوة، و روح الانتظار من أكبر نوافذ الفرج على المجتمع الإسلامي. و في ختام حديثه شكر سماحته جهود حجة الإسلام و المسلمين ري شهري و الأساتذة و الباحثين في مؤسسة دار الحديث لإعداد موسوعة الإمام المهدي (عج). قبل كلمة قائد الثورة الإسلامية تحدث حجة الإسلام و المسلمين محمدي ري شهري رئيس مؤسسة دار الحديث العلمية الثقافية مستعرضاً المميزات العلمية لموسوعة الإمام المهدي (عج).